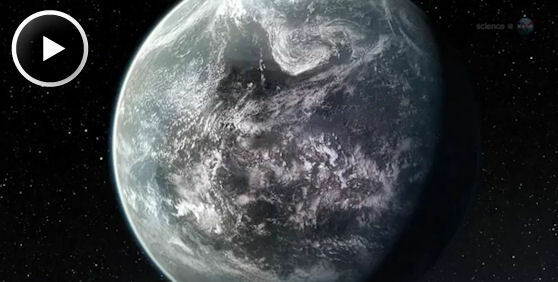 March 29, 2012: NASA's Kepler spacecraft is discovering a veritable avalanche of alien worlds. 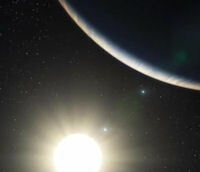 Recent finds include planets with double suns, massive "super-Earths" and "hot Jupiters," and a miniature solar system. The variety of planets circling distant suns is as wonderful as it is surprising. As the numbers mount, it seems to be just a matter of time before Kepler finds what astronomers are really looking for: an Earth-like planet orbiting its star in the "Goldilocks zone"—that is, at just the right distance for liquid water and life. "I believe Kepler will find a 'Goldilocks planet' within the next two years," says Shawn Domagal-Goldman, a researcher at NASA HQ who specializes in exoplanet biology. "We'll be able to point at a specific star in the night sky and say 'There it is—a planet that could support life!'" A ScienceCast video explores the challenges of studying faraway 'Goldilocks planets.' Play it! Kepler has already located a few Earth-sized planets, but they are too close for comfort to their parent stars. These recent finds have heightened the sense that a big discovery is just around the corner. But finding a Goldilocks planet is just the first step. Getting to know it is much more difficult. The problem is that, in the cosmic scheme of things, Earth-sized planets are relatively small, and the ones Kepler is finding are staggeringly far away. Most are hundreds, or even thousands, of light years away from Earth. Almost completely hidden by the glare of their parent stars, these distant pinpricks are very difficult to study. Fortunately, NASA has a plan. Light reflected from a planet carries the 'fingerprint' of its atmospheric composition. "The reflected light of an exoplanet tells its story," explains Kepler Program Scientist Doug Hudgins, also at NASA HQ. "To get at that story and learn about the planet's atmosphere and composition, we can use a technique called transit spectroscopy." The basic idea is simple: When a planet reflects the light of its parent star, the atmosphere of the planet leaves a subtle imprint on the reflection--a sort of spectral "fingerprint" that astronomers can study to learn what the planet's atmosphere is made of. One new mission under consideration by NASA, named FINESSE, is a fingerprint specialist. Short for "Fast INfrared Exoplanet Spectroscopy Survey Explorer," FINESSE would measure the spectra of stars and their planets in two situations: once when the planet is in view, and again when the planet is hiding out behind its star. In this way, FINESSE can separate the planet's dim light from the stellar glare and reveal the composition of the planet's atmosphere. NASA is also considering an observatory named "TESS"--the Transiting Exoplanet Survey Satellite. Supported in part by Google, the MIT-led mission is specifically designed to find exoplanets in the local galactic neighborhood. TESS would study hundreds of stars within 50 light years of Earth, close enough to study in some detail. "With better detectors and instruments designed to block the glare of the parent stars, these next-generation telescopes could not only find a Goldilocks planet, but also tell us what its atmosphere is made of, what sort of cloud cover graces its skies, and maybe even what the surface is like—whether oceans cover part of the globe, how much land there is, and so on," says Hudgins. Domagal-Goldman expects big surprises: "We've found so many unexpected things about planets that now I expect to be amazed. When we can study a Goldilocks planet, I believe we'll discover something revolutionary about how life interacts with a planetary environment. Nature is so much more diverse than we anticipated." "The possibilities," he believes, "are limitless." Credits: NASA's Ames Research Center manages Kepler's ground system development, mission operations and science data analysis. NASA's Jet Propulsion Laboratory in Pasadena, Calif., managed Kepler mission development. Ball Aerospace and Technologies Corp. in Boulder, Colo., developed the Kepler flight system and supports mission operations with the Laboratory for Atmospheric and Space Physics at the University of Colorado in Boulder. The Space Telescope Science Institute in Baltimore archives, hosts and distributes the Kepler science data. Kepler is NASA's 10th Discovery Mission and is funded by NASA's Science Mission Directorate at the agency's headquarters.